I have just delivered all my paintings to the Martin's Gallery in Cheltenham for The Natural World Exhibition . See my last post below for details. 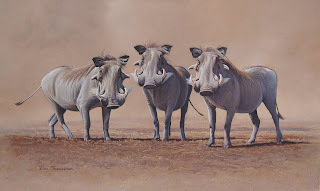 This painting of Warthogs , entitled 'Curiosity' will be in the exhibition. 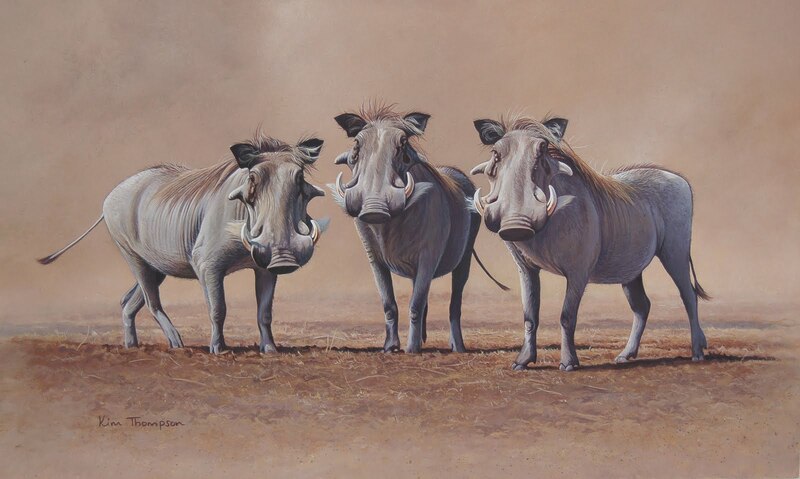 I painted it after a safari to Botswana when we had seen two family groups of Warthogs at a waterhole in Savuti. They are the most comical characters and such fun to watch as they trot about around the edge of the elephant herds. I love their shape and the energy in their movements and the way they carry their tails straight up in the air when scooting away from danger! 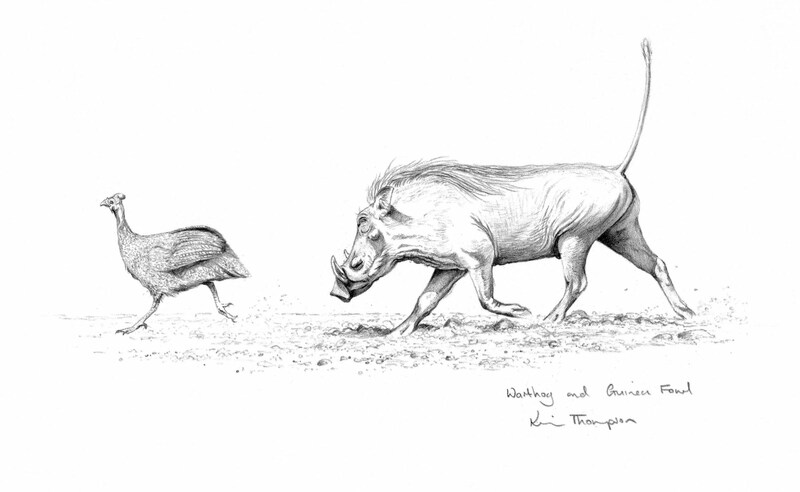 Often you see Warthogs and Guinea Fowl at a waterhole together and it is the interactions between all the different creatures as they wait to drink which really sticks in my memory from these hours spent watching the wildlife. The little pencil drawing (above) captures one such memory. This is being donated for auction to raise funds for The Butterfly Garden. The auction will be held on December 12th at The Martin's Gallery, Cheltenham. 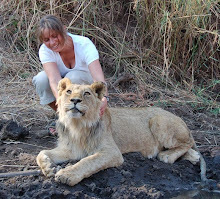 Hi Tracy, Thanks for your kind comments. 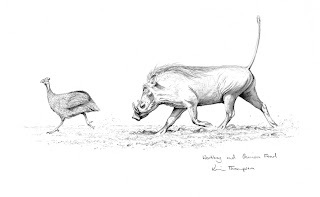 The exhibition was not so wonderful for the artists but luckily the whole event raised much needed funds for the cause!The Warthogs will be appearing in another exhibition and hopefully sell next time..... I need to find a Warthog fanatic! Excellent drawing and painting again Kim! Have you ever exhibited at the Bird Fair at Rutland Water? And do you know that the Biscay trips are finishing this year! Sorry for the delay in responding. Hectic at the moment with illustrating. Thankyou for the lovely comments! I did exhibit a couple of times at The Bird Fair and it was great. I was with a group of other artists and it was a good 15 years ago! I think it has grown a lot since then. I had heard that the Biscay trip was ending.....you will have to find another one to replace it (may I suggest somewhere warmer and calmer!! )Hope you are keeping well.